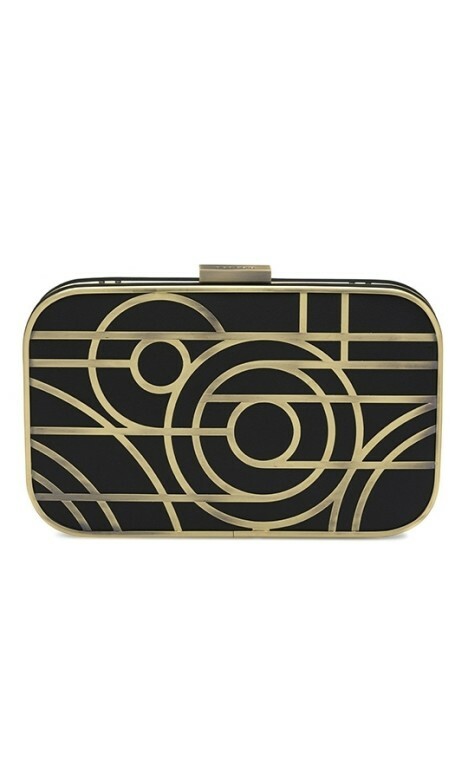 This stunning clutch by Olga Berg draws inspiration from Art Deco with its beautiful gold cage design. Crafted out of faux nappa with an embossed clasp, this clutch is the perfect accompaniment for your evening look! It also comes with an optional shoulder chain. Glam up your little black dress, or add a dash of flare to your floor-length gown! This ltitle clutch is perfect to hire for your next cocktail party! Rent this little clutch with some gorgeous gold accessories to match the clutch's accents, and dress up your little mini dress ensemble! For more cocktail inspiraiton, check out our 'Cocktail Event Style Guide' blog post!